Party bus in the parking lot. 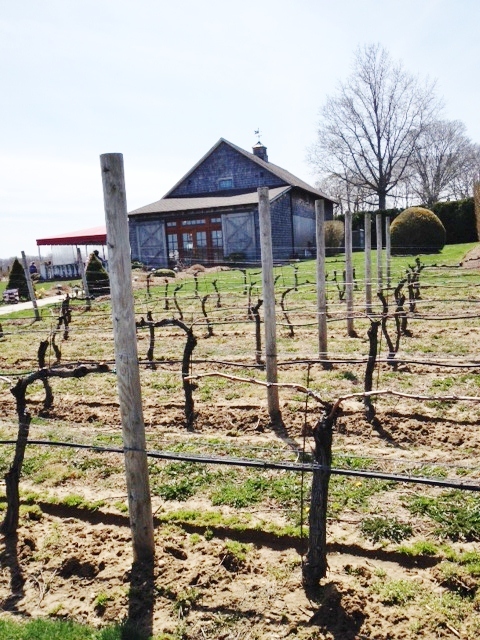 Clovis Point Winery touches history in two very different ways: it is named for a prehistoric type of arrow head that was used on Long Island, and the tasting room is in a converted 1920s potato barn. The former provides an attractive design for their bottles, and the latter a comfortably rustic space. 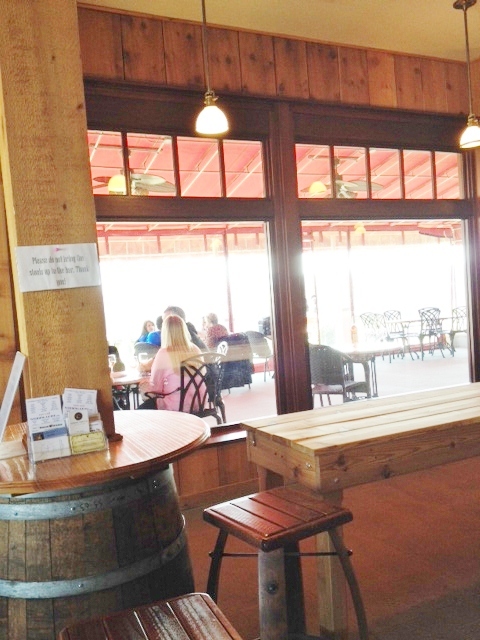 There is a long tasting bar plus barrel-based tables with stools, and then an outside semi-sheltered porch and an area of outdoor tables, both of which seem to be filled with groups. 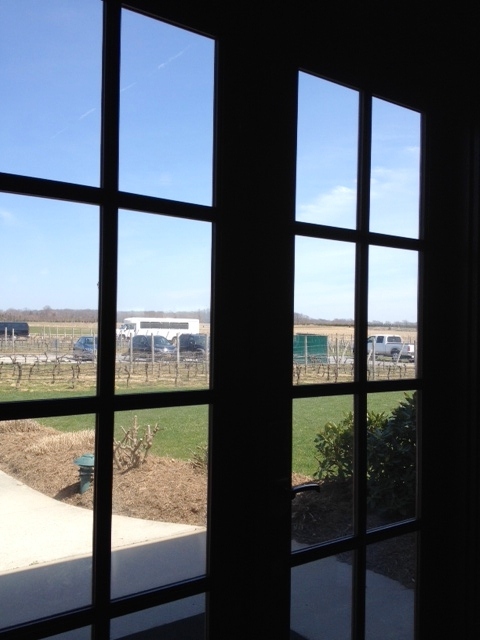 Though a sign at the end of the driveway says “No Buses No Limos No Exceptions,” there are two party buses in the parking lot, so I assume the no’s apply only to those without reservations. …but plenty of room on the porch. 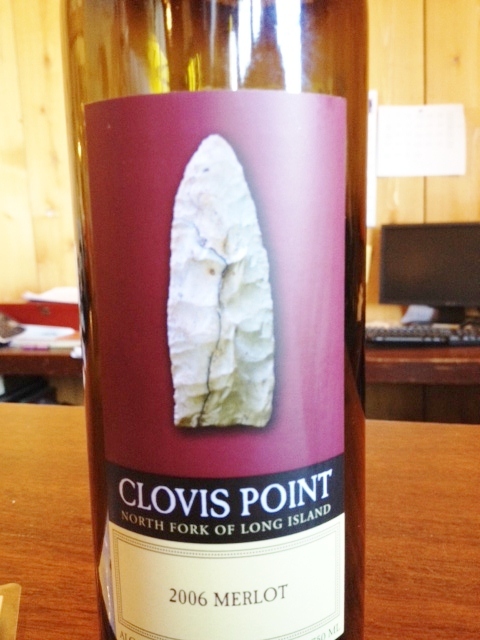 The last time we were at Clovis Point was in November of 2012, so it was time for a return visit. That’s one great feature of reviewing wineries—every year they have new vintages, so you never run out of material! This time we opted for two tastings: the “Cold” menu, which includes two Chardonnays and a Rosé for $8, and the Red, which features four reds for $10. We could also have chosen the Premium, which we had last time (check my entry for November 17, 2012), and which also has four reds, their more expensive options, for $15. The pour, by the way, is officially one ounce according to the measured pourer, but our server was generous with us, as she saw us sharing tastes and carefully evaluating each one. They also offer a small menu of snacks—mainly cheeses and meats and hummus—but, according to what we heard the server say to a nearby group, they are also open to people bringing in their own, as long as it’s not a whole huge meal. She was talking to a group which included wine club members there to pick up their shipment, and we saw a number of other wine clubbers doing the same. Surprisingly, one member of that group was chewing bubble gum throughout the tasting! Not sure what that was about, but personally I don’t recommend it. This continues to be an appealing wine, with 3% Gewürztraminer added to the Chardonnay for a bit of added complexity and depth. The aroma combines honey (I say) with some citric and grassy notes, and has a tart but nice flavor that reminds me of gooseberries, with some citric flavor. Very buyable, which we do. The menu would have us taste the Rosé next, but our server suggests that we might like to taste the two Chardonnays side by side. According to the tasting menu, this is made with 89% French oak fermented Chardonnay, 10% unoaked Chardonnay, and 1% Gewürztraminer, and it does provide an interesting contrast with the Stainless Chard. Butterscotch and nutmeg “on the nose,” as they say, and definitely butterscotch on the tongue, ending with a touch of welcome lemon, so that it has a mixture of sweet and sour. One could sip this if one liked oaked Chardonnays. What to eat with it? You’d need something assertive, like a well-flavored lobster or salmon dish. The rose is a pretty color. Again, this is a bit of a blend, which seems to be the house style: 97% Cabernet Franc, 3% Merlot. My husband insists the aroma reminds him of wassail, that spiced warm red wine drink from Scandinavia. Maybe. 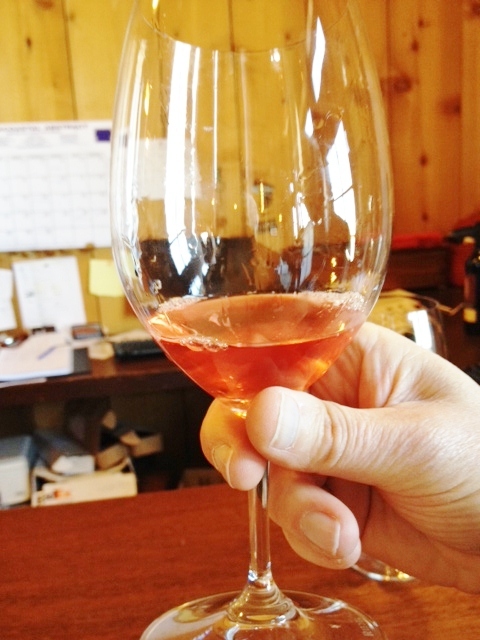 The taste is pleasant, with typical Rosé strawberry flavor, tart, with a touch of sourness at the end. A white pizza—no red sauce—would complement it. 76% Merlot, 19% Cabernet Franc, 5% Petit Verdot are blended together to make an undistinguished typical Long Island Merlot. Despite the blend, it lacks depth, but would be okay to drink with a burger. This wine is also on the premium list, and our server is very enthusiastic about it—as she is about all the wines, I have to say. She says this is a wine that “makes you want to have more.” And indeed, the smell is lovely—cedar, blackberries, a touch of earthiness—but the taste? Hmmm…not much to it, we say. I guess it would be easy to drink. 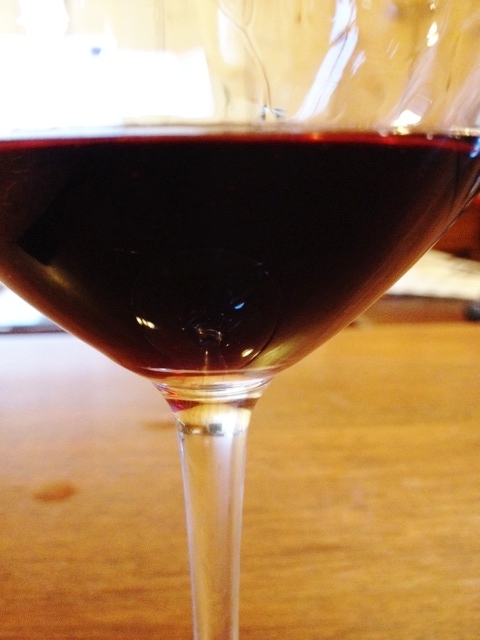 The Cab Franc is blended with 4% Merlot and 2% Cabernet Sauvignon. As we’ve heard frequently, 07 was a great year for North Fork grapes, and this one certainly proves that observation, as it is noticeably better than the 06. Our server notes that she’s bringing a bottle or two of this to a friend’s house tonight! We could bring this to a friend, too, though we’re not as happy with it as she is. 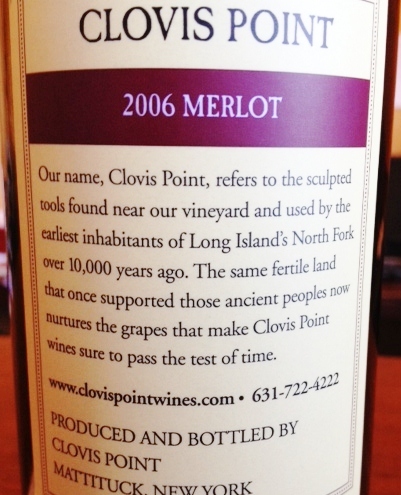 There are other Long Island Merlots, like Lenz’s, for example, that we prefer. Nice fruit—cherries and blueberries. Though this is a wine they “only make in good years,” we find it to be just pretty good—not a knockout. The server describes it as “smooth,” and my drinking companion notes “the barnyard has been tamed.” Spice and fruit aromas precede tastes of brambly fruit. The Merlot is blended with 15% Cabernet Franc and 5% Petit Verdot. 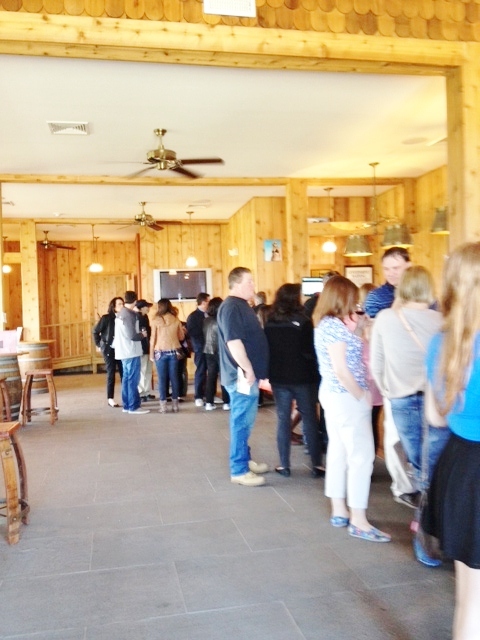 Reasons to visit: Pleasant tasting room, often with live music (we just happened to leave before it started today); the Stainless Chardonnay.